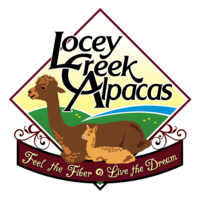 Quoted from Alpacas of America, Fortune Five Hundred is an exceptional example of what Alpacas of America is looking for in their Huacaya herd sires. 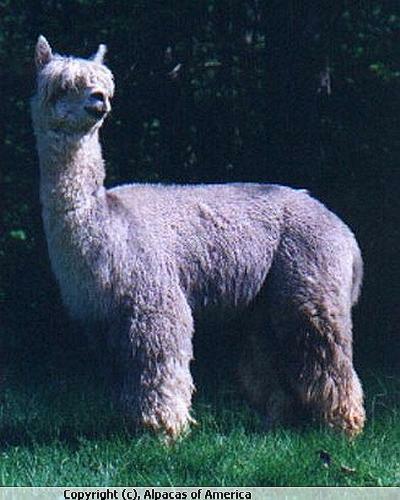 A carbon copy of his sire, this outstanding light silver grey male possesses dense, crimpy fleece with amazing head to toe coverage. Fortune Five Hundred has a tremendous presence and solid conformation all wrapped up in a package of soft, lustrous fiber. You can’t go wrong with a Fortune Five Hundred offspring. When we sent Fortune Five Hundred’s in for a histogram, we could not believe the phenomenal numbers he came back with. AFD of 19.7, SD of 4.2, CV 21.6, and %/30 only 2.8! Couple that with his amazing crimp and disposition and you may start to see how great this male really is. Fortune Five Hundred has already proven himself to be an elite herd sire here at Alpacas of America. To date over 96% of the time he is bred to black or grey he has produced black and grey! 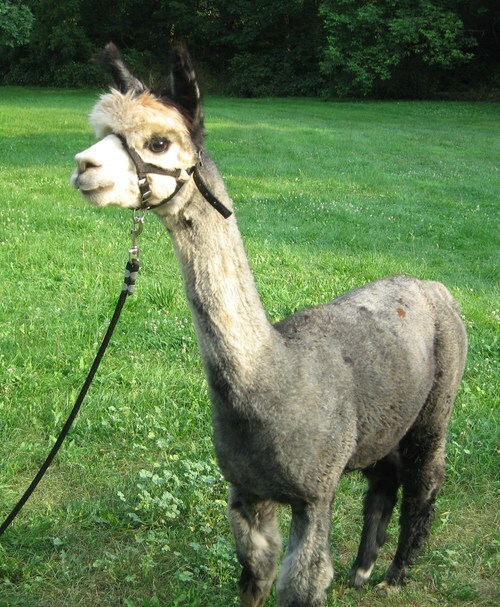 And a total of 82% of his crias are black or grey! Grand sire, Legacy de Bolivia is one of our most well know grey herd sires at Alpacas of America. 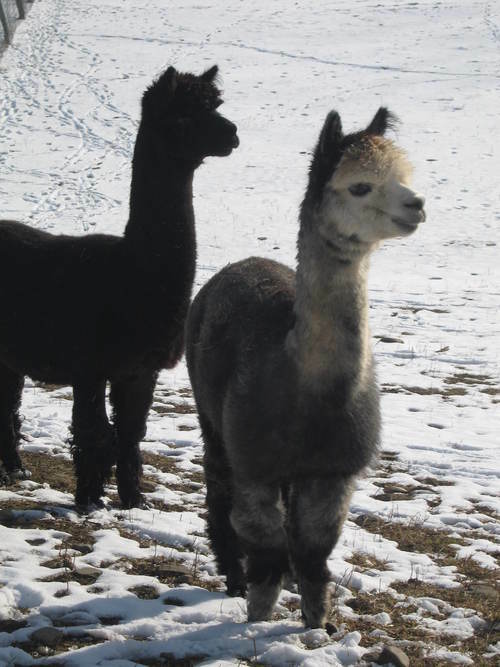 Known for reproducing his incredibly soft fleece that is extremely dense as well as producing several high selling alpacas, he has made is mark not only on our breeding program, but the national herd as well. When evaluating females and males for our annual Americas Choice auction we always look forward to seeing both direct Legacy offspring as well as his down line. 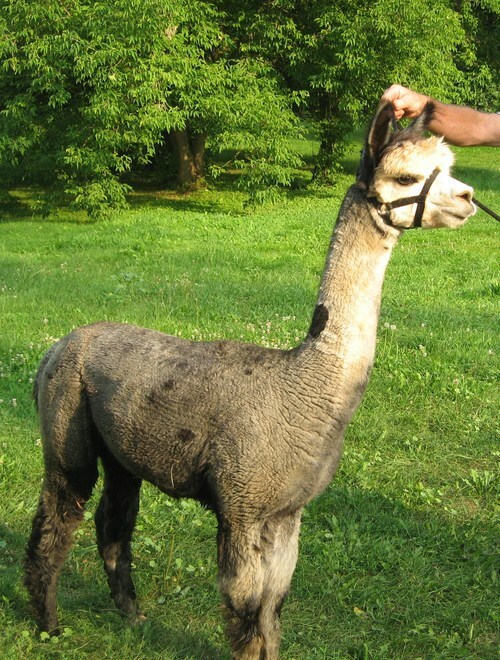 One of only a handful of unrelated silver grey herd sires in the United States he has proven his ability over and over again to provide us and our clients with crias that are highly admired. Some of his offspring currently in our breeding program include but is not limited to Fortune Five Hundred M0475 AOA (light silver grey). Rusty Nail stands out in the field. He carries himself as a Herdsire should. Coming from the west coast, Champion Blood line of Legacy De Bolivia and Fortune Five Hundred, Rusty is here to improve on your herd. We purchased Rusty in Virginia last summer, and he has been a blessing to our farm. He has great conformation, fine dense crimpy fiber and a wonderful disposition. He loves to attend events and have the attention of the chidlren. 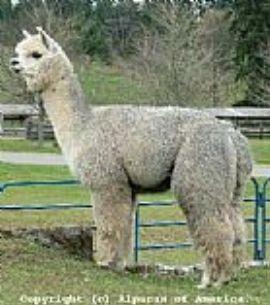 We expect crias in summer of 2014.